Door handles from The Door Knocker Company Company are available in brass, nickel, pewter finish and black iron. The lever handles are suitable for mortise locks and latches, some with a key hole suitable for locking doors and others without a key hole for internal doors. 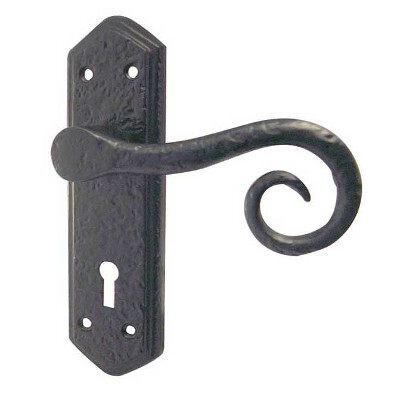 The Door Knocker Company also has a range of pull handles with a black beeswax finish for internal doors. This range of door handles will suit period property and cottage renovations as well as adding a touch of style to any traditional or contemporary property. Brass lever door handles with a key hole from "From The Anvil"
A black powder coated lever door handle suitable for mortise locks or latches. With or without a key hole. 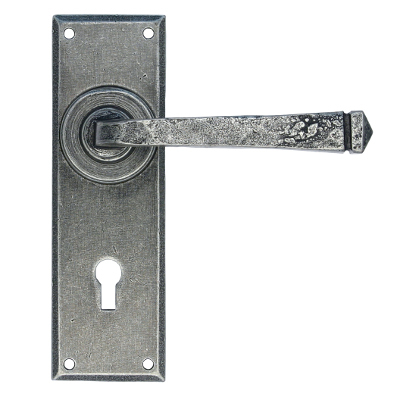 An sprung wrought iron lever door handle with a stylish pewter finish suitable for indoor and outdoor use. From the Anvil bronze Newbury lever latch handles. Beautiful large hand forged wrought iron door handles with gothic pointed detail. Forge blackened and finished with a protective bees wax. Sizes: 210mm (8.25") high x 40mm (1.5") max width. Beautiful large hand forged wrought iron door handles with bean shaped ends. Forge blackened and finished with a protective bees wax. Sizes: 204mm (8") high x 55mm (2 1/8") max width.